Where is the International Concern for Bangladesh? On Thursday February 28, the opposition leader and internationally renowned orator Delwar Hossain Sayedee was convicted by Bangladesh’s International Crimes Tribunal and sentenced to death. The murkiness around Sayedee’s trial almost does not bear repeating – this is the defendant whose witness was abducted by police and never seen again, and whose trial was most affected by the revelations brought by The Economist. Human Rights Watch published multiple statements demanding the missing witness be found and that a retrial take place in Sayedee’s case, but to no avail. While the court was in session, the government turned off social media, Facebook in particular, to prevent ‘negative propaganda’. Since the verdict, nationwide and worldwide protests erupted. Protests took place in the diaspora, with crowds gathering outside the Bangladesh embassies in London, Los Angeles, Sydney and elsewhere. Protests in Bangladesh, where Sayedee has his strongest following, proved disturbingly bloody with some reports suggesting at least 70 protesters were shot dead by police and pro-regime youth within the first 24 hours alone, and hundreds wounded. Police also sustained damage with four dead and more wounded. Thursday has come to be the bloodiest day in Bangladesh’s short history as a nation, and several opposition voices, including the leaders of the Bangladesh Nationalist Party, Khaleda Zia, and Jatiyo Party, Hossain Mohammad Ershad, condemned what they called the state’s mass murder of the public. While the suppression is hugely troubling, it is, however, nothing new under the ruling Awami League regime. In 2010, Mahmudur Rahman, the Acting Editor of the daily Amar Desh was arrested and brutally tortured in custody. Meanwhile, his newspaper was also shut down. This was in response to an article printed in Amar Desh which implicated Prime Minister Sheikh Hasina’s son, Sajeeb Wazed Joy, in corruption. More recently Kader Siddiqi, a decorated 1971 war hero, was summoned to court for suggesting the Bangladesh Home Minister, MK Alamgir, was involved in collaboration with the Pakistani Army in the war of 1971. Mahmudur Rahman, was ultimately released and his paper resumed, yet his grief from speaking truth to power was not over. More recently he again fell afoul of the authorities after he published exposing material on the International Crimes Tribunal (ICT). In December, an iconic investigative piece by the London-based The Economist revealed a cache of leaked material which exposed collusion between the Bangladesh ICT judge, state and prosecution. Following this, Amar Desh proceeded to print transcripts of the leaks in the public interest of exposing the political farce that is the ICT. Kader Siddiqi praised Rahman for his actions, proclaiming him a hero worthy of the Nobel Prize; Amar Desh was sold out and forced to reprint copies which were flogged at incredibly high prices. However, court orders were soon issued, Amar Desh offices surrounded by police, and Rahman has been unable to leave his premises since under threat of arrest. Amnesty issued a statement calling on the Bangladesh authorities to refrain from harassing the editor. The recent Shahbag protests, propelled and promoted by the ruling regime, have served to only exacerbate the situation. Shahbag’s undemocratic calls to ban opposition and dissenting institutions and media have driven the government to take an ever more aggressive stance against its critics. Recently, in tragic circumstances, a Shahbag blogger, Rajib Haidar, better known by his blog nickname, Thaba Baba, was found brutally murdered by unknown assailants. While investigations continue on this unresolved case, the protesters of Shahbag were swift to assume the opposition party, Jamaat-i-Islami, was responsible. The ruling regime pounced on the suggestion in spite of Jamaat’s denial, going so far as to threaten the party with banning. 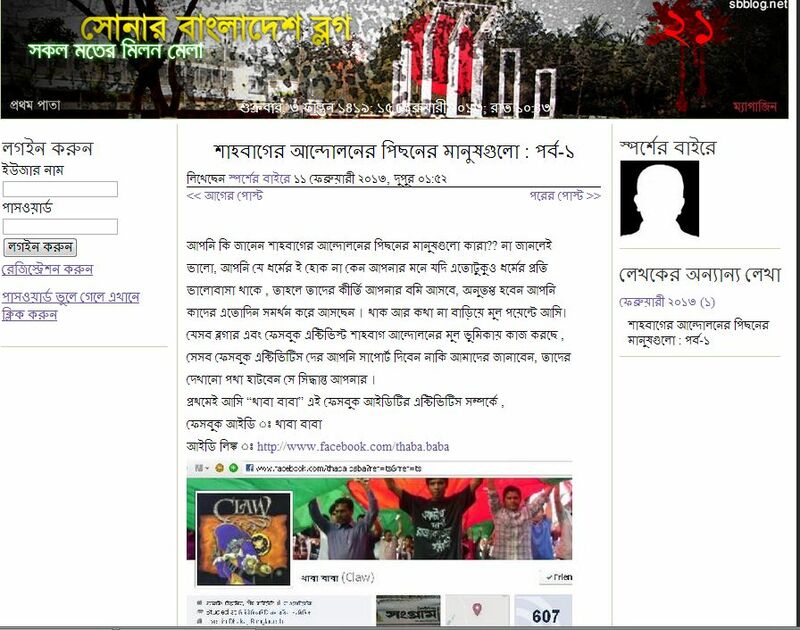 Soon after, Sonar Bangla, a prominent blog run by the opposition that published critique of both the ICT and the Shahbag movement was shut down by the government. This especially followed circulation by Shahbag activists of screenshots from a particular Sonar Bangla blog in which Rajib had been identified as a lead Shahbag campaigner and atheistic in belief. The blog was hardly evidence for a murder, yet the Shahbag online activists circulated it as such and demanded that Sonar Bangla be closed. The government, in the obliging manner reserved only for its Shahbag supporters, seized upon the opportunity to shut down one of the opposition party’s few, if not only, prominent portals for citizen journalism in the country. Sonar Bangla’s editor, Aminul Mohaimen, was also arrested. By Bangladeshi law, any arrested individual must be produced before court within 24 hours. Arrested on Feb 16th, Mohaimen disappeared for a week, leaving his family traumatised for his life. His wife, Aasia Khatun, commented, ‘I along with my two children am passing days with huge agony and an unbearable trauma’. Khatun further stated she attempted to make an application with the police in connection to Mohaimen’s disappearance, but it was not accepted. There were fears Mohaimen had joined a long list of forced disappearances, a rampant issue under this regime. Past such victims include ICT defence witness and victim of 1971 atrocities, Shukho Ranjan Bali, whose abduction has been reported by Human Rights Watch and in whose case also the police refused to accept any applications. Thankfully, Mohaimen was brought before court on February 23rd. The court charged him for destroying a shop, a remarkable accusation he denies, and placed him behind bars. If I were in Bangladesh right now, I would have never dared to write this, never ever. You can take risk on your own life, but no one wants to put their family members in harm’s way. In Bangladesh now, if you say something and it goes against the interest of the government and/or its allies, you must pay the price. RAB (Rapid Action Battalion) or DB (Detective Branch) police will be haunting you. If you are lucky enough to escape, well, there is always someone in your family to pay off. « Muslims and Evolution in the 21st Century: A Galileo Moment?